Choco Choco: A delicious double dose of semi-sweet and rich dark chocolate with premium peanut butter and wild honey — it's decadence and delight in every bite. From the natural peanuts raised right here to the delectable premium dark chocolate direct from Belgium, Choco Choco brings the best of both worlds together in a mouth-watering mix of flavor goodness. They've even added a touch of honey to enhance the chocolate taste, making it twice as tasty. Cookie Nookie: A mouth-watering mix of chocolate chips, cookie dough flavor, wild honey and premium peanut butter — it’s two classics together as one. Don’t let the name fool you; this tasty treat is for kids of all ages. They start with farm-fresh peanuts, blend in natural cookie flavoring and add chunks of real milk chocolate. With a dash of MEL-O honey, Cookie Nookie will knock the socks off every peanut butter lover. Razzle Dazzle: A twisted blend of red raspberry, wild honey, cool white chocolate and rich dreamy darkness — this peanut butter offers a magical mix of deliciousness. The start with fresh peanuts raised by family farms. Then they add natural raspberry flavoring, mix in the perfect amounts of white and semi-sweet chocolate and just a touch of MEL-O honey for a bewitching taste sensation that is as lip-smacking good on bread as it is off a spoon. Coco Bananas: A tropical blend of yummy bananas, cocoa and wild honey, this peanut butter adds a taste of island paradise to any kitchen. You'll go ape for this unique flavor creation. They use only the finest peanuts raised at family farms and add a mix of natural banana flavor, real chunks of semi-sweet chocolate and MEL-O honey for a true taste evolution. 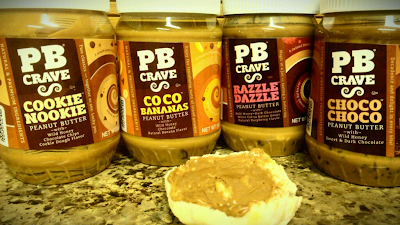 My entire family (children, husband and I) will tell you that PB Crave peanut butter is simply delicious! It's like no other peanut butter that you have ever tasted! You simply have to try it for yourself - trust us, you won't be sorry! 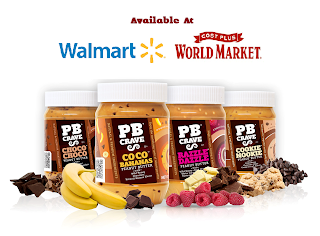 All PB Crave peanut butter varieties are gluten-free and cholesterol-free, plus they are kosher certified. They have all the taste you want and none of the stuff you don't want... No hydrogenated oil, no artificial flavors, no syrups, and no high-fructose corn syrup. twisted taste sensation that gives you more of the mouthwatering flavors you crave—without the stuff you don't.